Mayor’s 'Crisis Response Team' Now Accepting Applications - Yo! Venice! The Mayor’s “Crisis Response Team” is now accepting applications for the Fall 2013 class. Download the CRT application by clicking here. Bilingual volunteers encouraged to apply! 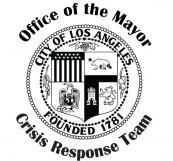 Members of the Mayor’s Crisis Response Team (CRT) are volunteers who respond to traumatic incidents at the request of the Los Angeles Police and Los Angeles Fire Departments. CRT volunteers provide immediate on-scene crisis intervention, act as a liaison between the victim and emergency personnel and give referrals to victims and their families affected by a death, a violent crime or other traumatic incidents. These incidents include homicides, suicides, serious traffic accidents, natural deaths and multi-casualty incidents. During the required seven week training to be a member of the Mayor’s Crisis Response Team you will be provided the background, information, training and support to be able to respond to crisis situations as a member of the Mayor’s Crisis Response Team.